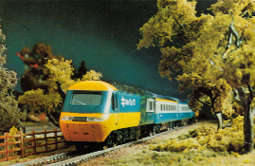 Information: Part of British Railways Diesel Pilot Scheme the Type 2, later TOPS Class 28 locomotives are considered one of the least successful first generation diesels. Details: During 1958 British Railways placed orders totaling 20-units with Metropolitan-Vickers in conjunction with Beyer-Peacock for a diesel locomotive with an unusual wheel arrangement promising a high power ratio with lower axle loading than conventional designs. A single V-8 two stroke diesel engine provided power to transmissions on all five axles. Unfortunately, the design did not live up to expectations. Rather than producing a single prototype for evaluation, all twenty locomotives were built to a single order. The first locomotive entered traffic in July 1958 with the final member leaving the Stockton-On-Tees workshops in October 1959. Problems with mechanical equipment were evident from the start. By June 1960, only three of the twenty locomotives were in service because of engine problems, resulting in the entire class being rebuilt during 1961 and 1962. In traffic the class worked singly and in pairs on both passenger and goods services. The most prestigious duty assigned possibly being the double headed “Condor” ore trains between London and Glasgow. Problems continued after rebuilding resulting in the entire class being confined to services in the North West. Because of on-going mechanical problems the class was deemed “non-standard” and with-drawn between September 1967 and September 1968. Many members had been stored unserviceable prior to the official withdrawal decision. Locomotives were out-shopped in green with a light green lower body-side stripe. Mandated small yellow warning panels at the cab ends were added at a later date. Only one member survived long enough to be painted Corporate Blue livery with full yellow ends. Despite their problems, one member managed to escape the breakers torch. After withdrawal D5705 was acquired by the Research Division and later used as a stationary carriage heater until 1980. She is currently undergoing complicated and costly restoration located at the East Lancashire Railway.